I started to collect wood, there is a ton of it right near the DTBH, which is handy because they have a little wagon that I can borrow to drag it around. I have some old burlap sacks that used to hold coffee beans, these will be perfect for holding and transporting the wood. After messing around with it I realize I had to apply for a car permit to haul everything onto the island, this stuff is heavy! I'm also going to need to chop it up into smaller pieces to make it more manageable. In other news I got my branding iron, and it gets super hot, and really holds the heat. I was worried it would be too wimpy, but in just 10 or 15 seconds it burns it really well. I'm having trouble controlling it to get a clean image. 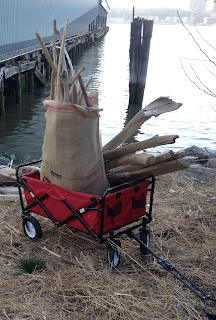 Driftwood collected in the New York harbor will be transformed into sculptures and drawings by the festival goers. When the pieces are finished they will be documented with pictures and descriptions and set adrift in the harbor where they can be found by someone else. Each one will carry the address of an interactive website so that the person finding it can contact the original artist. The project allows Figment participants to create sculptures and drawings on an unusual medium, and then share their work far beyond the festival itself via the random currents of the harbor and the Internet. Participants will transform pieces of driftwood that have been collected from the New York harbor into sculptures and drawings. After being photographed each piece will be re-released into the harbor so that someone else outside of Figment, at a different time, and in a different place can find it, and report back to the original artist how it affected them. Each piece that is released will contain a burnished stamp that instructs the person finding the sculpture in the water to go the project blog www.windNwavesONwood.org to find out more about the piece they have found, and report back to the original artist their thoughts. They will also hopefully report the location where the item was found. Driftwood starts out as angular hard pieces of material, but over time the wind and waves shape it by smoothing out rough edges, creating new contours and very very slowly transforming them into new shapes with new finishes. This transformation will be further enhanced by the festival goers as they make the material into sculptures in both two dimensions and three dimensions. The most intricate part of the work will be done by nature before I collect the wood and the festival goers leave their mark on it. Some of the wood will have come from up to 1,000 miles away and has been circulating in the harbor for months on end. The project goal is to inspire people to think about the most dominant natural force that is around them on their day at the Island, the harbor’s dynamic moving water. The harbor is a wonderful recreational resource that all New Yorkers can enjoy, and we want to get that message out to the general public. Some basic facts will be presented on signs that describe how the tidal currents flow in the harbor, and the impact of trash and pollution on this wonderful recreation and transportation medium. While all of the material we will use is natural non-polluting material that will eventually break down, the same forces that shape and distribute the driftwood also spread trash throughout the harbor. On many shorelines in the harbor there is far more manmade trash than driftwood. The raw material will all come directly from the NYC harbor, less than 10 miles in any direction from Governor’s Island. It will consist solely of driftwood. I will collect up to 100 pieces in every size and shape. The festival goers can draw on the wood using paints, markers, and the sun. They can also attach pieces together with wooden dowels. I will provide a wide variety of sample pieces, and as each artist completes a work it will remain on display for the rest of the day. When each piece is finished I will encourage the artist to: 1) Supply a name for it. 2) Record some poignant written thoughts about the piece, or life in general. 3) Pose for a picture with their work. 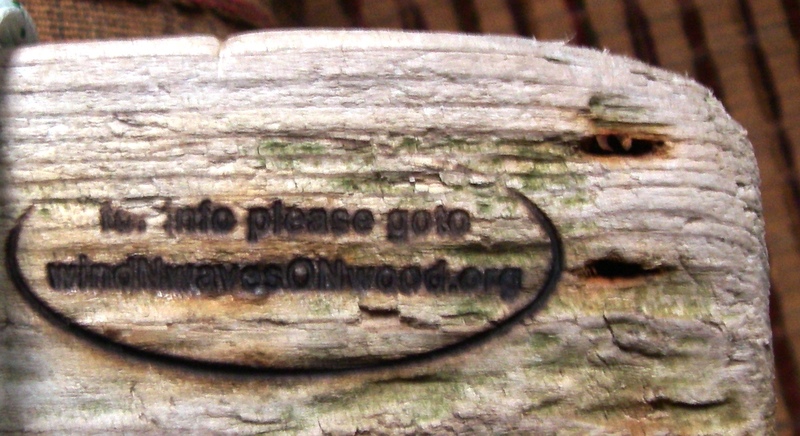 The driftwood will all be branded with a wood burning tool BEFORE the festival listing the website: www.windNwavesONwood.org. Each finished piece will be put back into the harbor so that someone else can find it. As the pieces are recovered in the months and years that follow the people finding it will be able to comment back to the blog and continue the fun. As an artist I am acting as a facilitator. I will select and partially sculpt the raw materials, but much of the art will be done by the festival goers. Anybody who attends the festival will be able to produce a piece of art, share their written thoughts, and then be open to someone else finding and enjoying the work at another time.